Last month at The Game Awards, NetherRealm Studios finally unveiled the long-rumored Mortal Kombat 11, and today during a blowout livestream event, they revealed a ton of new gameplay footage and information. In addition to Scorpion and Raiden, who were shown during the Game Awards cinematic trailer, NetherRealm showed off several additional fighters, including Sub-Zero, Sonya Blade, Skarlet, Baraka, and new character, Geras. It was also revealed Shao Khan will be a pre-order bonus, and we glimpsed Liu Kang, Kung Lao, Shinnok, and others in cutscenes. Check out the debut gameplay trailer, below. NetherRealm also dropped individual showcase trailers for Sonya Blade and Geras. Sonya is being portrayed by UFC pioneer and current WWE Women’s Champion Ronda Rousey, and it looks like she’s getting a whole mess of new sadistic gadgets. Meanwhile, Geras kind of looks like he plays like Jax, with additional supernatural time-travel powers. Check out both Sonya and Geras below. But that’s not all! We also got a look at the game’s story prologue, which teases our new antagonist Kronika. And, of course, what would a Mortal Kombat reveal even be without Fatalities? Maybe don’t watch this gorefest directly after eating lunch. Looks like NetherRealm have really outdone themselves this time! Mortal Kombat 11 looks maybe a little bit slower than the previous game, but it should deliver more depth. 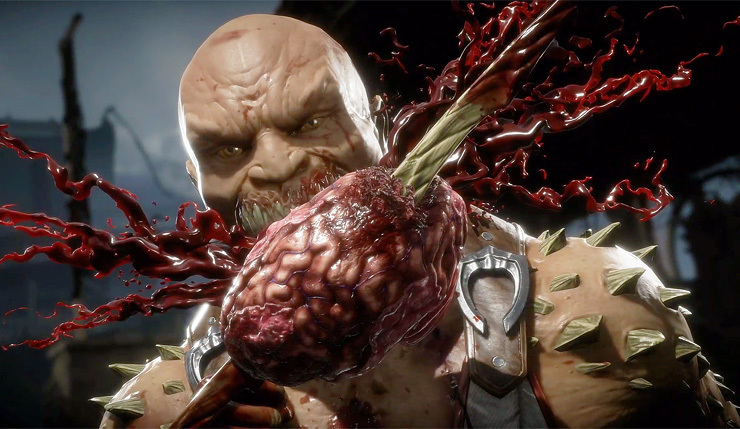 During the livestream, series creative director Ed Boon delved into some of the game’s new mechanics – the game now has separate offensive and defensive meters, and new brutal “Fatal Blows” that activate when you’re low on health. Finally, NetherRealm also revealed the date for Mortal Kombat 11’s online beta (March 28) and the game’s swanky Kollector’s Edition, which includes the Premium Edition of the game, a Steelbook case, a MK logo magnet, and a full-size Scorpion mask. Check it out, below. Mortal Kombat 11 slices and dices on PC, Xbox One, PS4, and Nintendo Switch on April 23. Pre-orders are open now.